Raising the price of fishball noodle may not be as straight forward as it seems. A topic close to the hearts of Singaporeans surfaced last week when a young Gen Y hawker, Mr Douglas Ng, shared his thoughts after attending the tender briefing for the new Bukit Panjang Hawker Centre managed by NTUC Foodfare. His cause for concern was the requirement of having a “minimum price set for every stall”; $2.70 for fish ball noodles. It is first important to point out that what hawker Douglas probably meant when he wrote “minimum price” is actually a price ceiling (i.e. a maximum price capped for a food item). NTUC Foodfare has a standard policy where each stall owner has at least 2 items that are not priced over a certain benchmark so as to allow for an affordable range of food that budget conscious consumers can purchase. 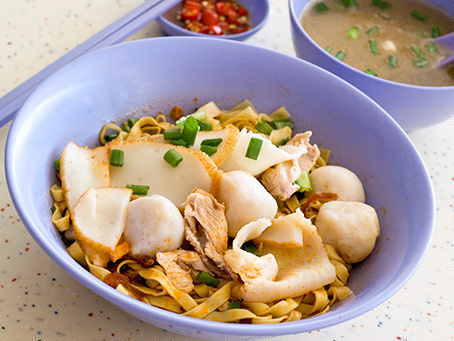 Singaporeans are divided about how much a bowl of fishball noodles should really cost. On one hand, we are used to the $2.50 – $3 price range that the old generation hawkers are pricing their fish ball noodles. On the otherhand, hawker Douglas asked a good question, which is why certain Asian dishes, like fishball noodles ($2.70), have to be priced lower than western dishes, like a plate of Spaghetti ($5.80). Besides, he argues, Singaporeans are already paying a premium for other Asian dishes such as a bowl of Ramen in shopping malls. So why not pay more for a bowl of fishball noodles? Price = Marginal Cost. P=MC. That’s what our first year econs lecturer drove in our heads when explaining about a perfectly competitive market. If there were excess profit in any particular industry, competition from new entrants will drive price down to such levels where price will equal marginal cost. To be clear on this point, excess profits do not translate into zero profit. Rather it refers to no company being able to make anything beyond the “normal” profit it is entitled to for the opportunity cost put in. Some textbooks call it no economic profit. The logic is simple. Excess profits in an industry meant that new entrants could enter the market and simply undercut existing players by bidding down the price or increasing current cost. For example, if Starbucks were to make insane profits selling its coffees in an existing prime location, other players, who are in the coffee business such as Coffee Bean could enter the market by bidding up existing rent. Let’s assume that there is no price ceiling and that a hawker could sell the same quantity of fishball noodles for $5.80 as he could if it was priced at $2.70. This scenario of high profits that hawker Douglas wishes for, will, according to him, be a strong motivating factor for more Gen Y hawker to join the trade. Isn’t that great? Not exactly. Unless there is a large supply of stall space in Singapore (last we check, there wasn’t) these new “Gen Y” hawkers can only enter the market by competing for the same stall space that existing hawkers are occupying. Creating more space within a coffeeshop for two fishball mee stalls while possible isn’t feasible. What would happen in this instance would be the rents of stalls in either the coffee shops or hawker centres being bidded up. With all due respect to the trade, fishball noodle stalls are fairly common in Singapore and there is no shortage of good hawkers (or bad ones). Stall spaces would eventually command high rents and the increase in price that consumers are paying for their fishball noodle would translate into higher profits for landlords. Unfortunately, there is no economic logic to suggest that the hawker (though deserving) would be the main beneficiary of this increase in price though it may appear that way in the short run. Ever wondered why F&B outlets in Singapore shopping malls are constantly changing? Aside from the fact that some of these outlets sell lousy food accompanied with equally bad service, the main reason is the high rents mall operators charge, which could be in the region of $20 – $30 per square feet. Noticed how a $6 Latte is (almost) always served at a nice café within a shopping mall or at a chic location? The reason for the high price is not so much because of the taste of the coffee, but because of the ambience and atmosphere the café provides. You will feel comfortable to have a conversation with your date or have a business discussion there. But it will be harder to do that in the local coffee shop, regardless of how good the traditional $1.10 coffee might be. Are these cafés making great profits? The answer is probably no and the reason is simple. The rental and operational costs are likely to take away a big chunk of the gross profits made. Operating a café in the CBD area is a totally different business from selling “Kopi” at the local neighbourhood. Likewise, comparing a $2.70 fishball noodle sold at a coffee shop to a $15 bowl of ramen noodles sold at a mall is simply not equitable, even if they both are selling the same commodity, food. Who is right, who is wrong? NTUC Foodfare is not wrong in setting a price ceiling for at least two items per stall in return for a lower rent. The company, being a co-operative, seeks to ensure that prices of food are kept at an affordable rate for all people in the community. At the same time, neither is hawker Douglas and others who share the same viewpoint, wrong. There are no reasons why a fishball noodle hawker should sell at a price that he feels will not commensurate him fairly for the effort required, especially if he is convinced people are willing to pay more. However, the fact is that no one is stopping these hawkers from simply opening another stall in another coffee shop if they feel they can find a better deal elsewhere. Ultimately, no one can force them to sell a food item at a price that they do not think is reasonable. Would this result in higher, more expensive rents that proves unsustainable? We don’t know for sure, but we are guessing the Gen Y hawkers would have done their math. Is M1-No-Frills-$30 Mobile Plan Cheaper?